Cranfield University Blogs | Want to learn more about open access to academic research? A new film has been released called Paywall: The Business of Scholarship. It explores issues that are very pertinent to all academics, not just at our university, but across the world. The documentary focuses on the need for open access to research and science, and questions the rationale behind the $25.2 billion a year generated by for-profit academic publishers. It also examines the 35-40% profit margin associated with Elsevier, one of the major academic publishers, a margin that is often greater than some of the most profitable companies in the world, such as Apple, Facebook and Google. It is free to stream and download for both public and private use from https://paywallthemovie.com/. It is essential viewing for early career academics and research students who are relatively new to academic publishing, but will also be of interest to more seasoned scholars. Library staff held their first ever film screening across the Shrivenham and Cranfield sites when it was released in September. It was introduced by Andrew Kirchner of our Research and Innovation Office (RIO), who gave us some background in terms of the huge amounts that universities around the world pay to the big academic publishers, and after the film we enjoyed tea and delicious home-baked vegan cakes and biscuits whilst continuing the debate with the students and academics who had come to watch. The film features a series of interviews with librarians, publishers, editors, academics and students and examines the inherent unfairness of a system that makes libraries and individuals pay for access to publicly funded research. It makes the point very strongly that taxpayer money funds research but we then need to pay again to read the outputs – academics from all over the world are working to fight the world’s ills, so everyone needs access, not just rich countries. The odds of us solving these big problems are therefore reduced. Information must be democratised so that previous work can be built upon. Some students interviewed for the film admitted that they decided what to study partly based on what information they can access. However the debate in the room after the film showed that no one here had done this – or at least no one admitted to it! I see academics every day struggling with the tension created between their knowledge of the ‘best’ place to publish their research, and the push to publish in high impact factor journals. The film suggests that academics should be evaluated on what they publish rather than where they publish. The discussion in the room after the film agreed that a global movement for this change is needed before it will happen. Elsevier gets a very bad press in the film. One librarian says “[Elsevier is] a pain in the neck for us in Africa”. It is incredibly expensive, in fact, UK universities paid £42 million to Elsevier in 2016. In addition, it is dependent upon the free labour of academics to act as reviewers and editors. In effect, they have libraries over a barrel – the ‘big deal’ model means that we have to buy lots of titles bundled together that we don’t actually need. Publishers can remove content from packages without any notice and we have no control over this. I was fascinated to learn that the Linda Hall Library (an independent research library in the US) has solved all these issues by remaining a print-based service. So there’s no need to log in, it’s open to the public, and anyone can access it. However, I don’t think that approach would be popular at Cranfield! Would you want to physically visit the library each time you needed a journal article? Although of course we always love to see you in our libraries! Have you watched the film? 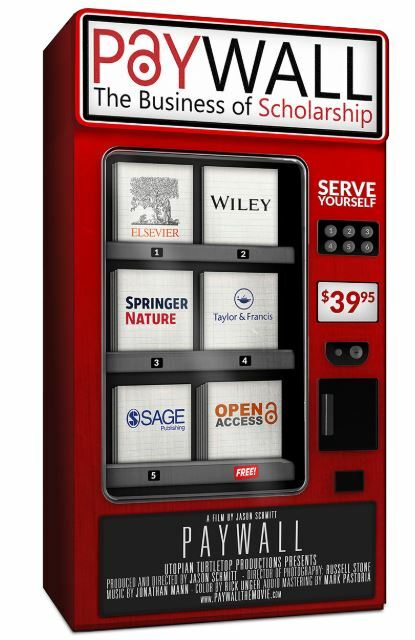 What do you think about the challenges around open access and scholarly publishing?